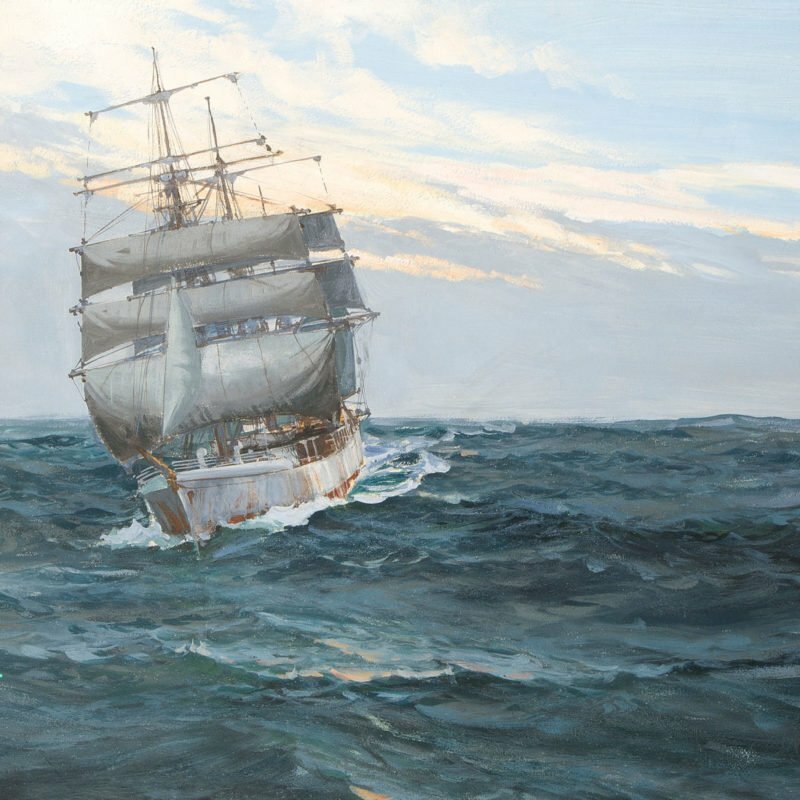 Known for his sailing paintings, John Steven Dews is the pre-eminent marine artist of our day. 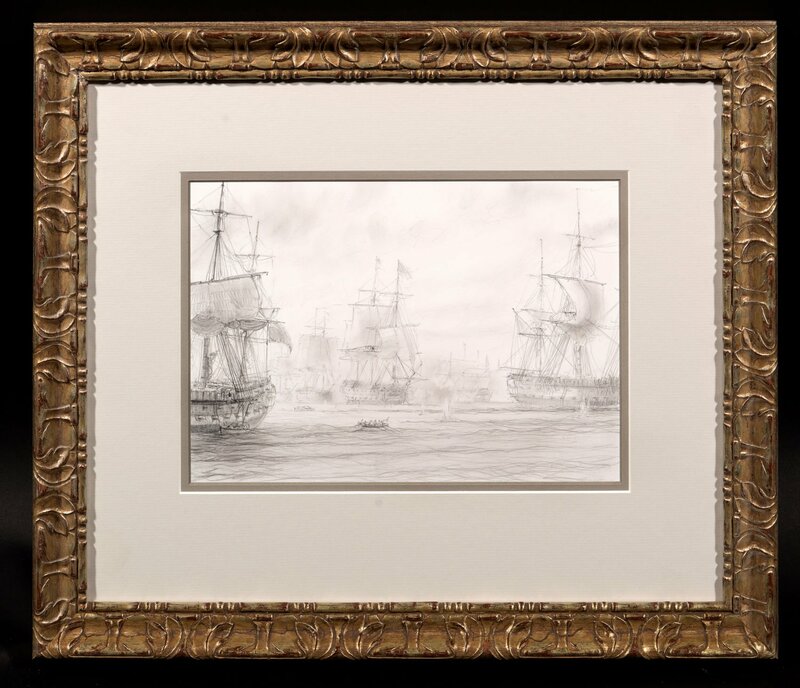 This ghostly drawing was Dews’ preparation for one part of a set of spectacular, large- scale depictions of four great 19th Century sea battles, namely; The Battle of Trafalgar, the Battle of Copenhagen, USS Constitution v. HMS Java, and The Battle of the Chesapeake, which have all sold for exceedingly high prices. The League of Armed Neutrality, Led by Russia, included Denmark-Norway, Sweden, and Prussia all of whom called for the ability to trade freely with France. Britain, wishing to maintain their blockade of the French coast and concerned about losing access to Scandinavian timber and naval stores, immediately began preparing to take action. 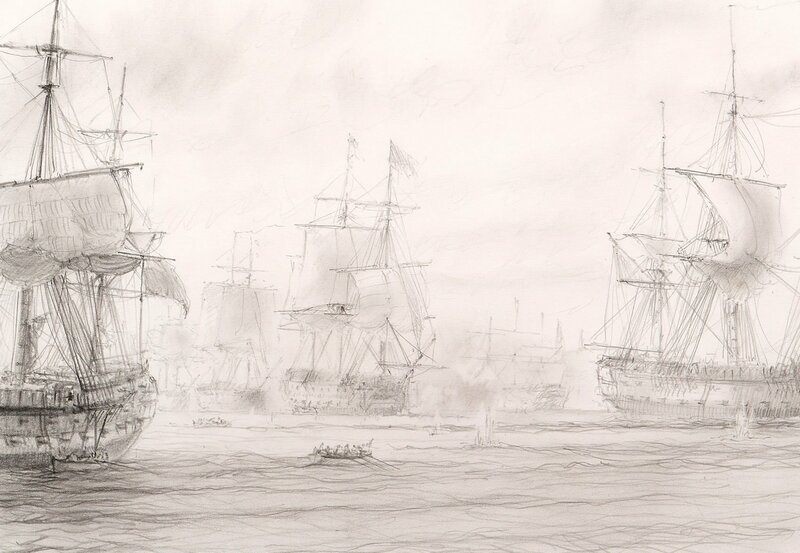 In the spring of 1801, a fleet was formed at Great Yarmouth, England under Admiral Sir Hyde Parker with the purpose of breaking up the alliance before the Baltic Sea thawed and released the Russian fleet. The Battle of Copenhagen was an engagement which saw a British fleet fight and strategically defeat a Danish-Norwegian fleet anchored just off Copenhagen on 2nd April 1801. Vice Admiral Horatio Nelson led the main attack and is famously is reputed to have disobeyed Sir Hyde Parker’s order to withdraw by holding the telescope to his blind eye. His action, in proceeding into battle, resulted in the destruction of many of the Dano-Norwegian ships before a truce was agreed. One of Nelson’s great triumphs, the Battle of Copenhagen cost the British and the Danes in lives and ships. In the days after the battle, Nelson was able to negotiate a fourteen-week armistice during which the League would be suspended and the British given free access to Copenhagen. Coupled with the assassination of Tsar Paul, the Battle of Copenhagen effectively ended the League of Armed Neutrality. Historical boating events are Dews’ subject of choice, and from the lifelike nature of this work one can feel his passion for boating. The way in which the huge ship sits serenely upon the choppy water as it makes it way out to sea is highly realistic. The huge, looming ships help to infer a sense of drama; and one is given a strong impression of the expansiveness of the sea and sky, which seem to reach on forever. In his spare time, Dews is a sailor himself, and paints from a body of technical sailing knowledge, as well as an artistic one, making his paintings unparalleled in their precise attention to detail and technical accuracy. John Steven Dews was born near Hull, Yorkshire in 1949, and his connection with the sea began from an early age, when he inherited a love for the ocean from his Grandfather, who was an Assistant Harbour Master. The boy’s ability for painting ships was first recognised when he was five, and his picture was displayed in the school hall. His late teens however, were less promising; he failed his art A Level and then dropped out of a Fine Arts Degree after only a few weeks, because he disagreed with the way it was taught. However, he went on to build a spectacular body of work, ready for his first exhibition in 1976, where nearly every painting was sold and his stratospheric rise to success began. The following year he held an Exhibition in San Francisco which also sold out to great critical acclaim, and since then, Dews has continued exhibiting regularly at leading galleries in London and around the world. Validation of his pre-eminence came in the Sotheby’s sale of Maritime Art in London on April 28th 1999, where his original, entitled ‘Off Cowes’, sold for a phenomenal price for a living marine artist.